A total of 396,613 registered voters on Saturday trooped out to vote in the rerun elections in five states, following the declaration of some governorship elections in the affected states as inconclusive by the Independent National Electoral Commission (INEC). INEC is conducting the rerun elections in 618 polling units across 96 local government areas in Kano, Benue, Sokoto, Plateau and Bauchi states to determine the winners in the respective states. INEC had declared the March 9 governorship elections inconclusive in the five states and Adamawa. But the rerun of election in Adamawa could not hold on Saturday because of a court action. There are some reports of violence in some voting units, while in some others the conduct of the polls was peaceful across the five States. 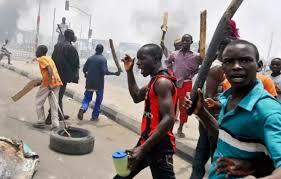 For instance, in Kano State, thugs armed with sticks, clubs and machetes were seen patrolling the Gama Ward in Nasarawa Local Goverment Area of Kano State and chasing away the voters and the journalists covering the conduct of the polls. Local media reports said that the miscreants also forced vehicles belongings to the media and observers off the road. It was a different experience in Plateau State where the Plateau State Commissioner of Police, Mr. Isaac Akinmoyode said that the supplementary election in the state was going on in a peaceful atmosphere. Akinmoyode told journalists while monitoring the rerun election that “so far the election is going on peacefully in all parts of the state”. “We hope that it will be peaceful till the results are collated and the winner is declared. “We have adequate security personnel at every polling unit where election is ongoing,” he said. In Sokoto State, voting was said to have been disrupted at Kofar Atiku polling unit 009, Sokoto, following attempts by a party agent to influence an aged voter to vote for his candidate. The agent was challenged by the other agents and this led to shouting and pushing that threatened the voting process and the electoral officers were forced to suspend voting in the unit. In Bauchi State, some electorates chased politicians from disrupting the voting process in Kagadama polling unit in Dass Local Government Area of the state. The voters resisted any attempt by the politicians to come near the polling unit as soon as they sighted them. The voters also insisted that they would remain on the queue despite the fracas and that they were determined to vote for the candidates of their choice. Meanwhile, alongside the rerun of governorship election, there are also the rerun elections for some seats in some States House of Assembly in Lagos, Kogi, Imo, Benue, Sokoto, Ebonyi, Plateau states and Abuja on Saturday. Generally, there are reported cases of low turnout of voters and sporadic violence which were quickly addressed by security personnel in the rerun for States Houses of Assembly.